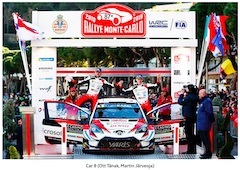 TOKYO, Jan, 28 2019 - (JCN Newswire) - Ott Tanak has delivered a podium for the TOYOTA GAZOO Racing World Rally Team on the opening round of the 2019 season, with a superb fightback on Rallye Monte-Carlo. Jari-Matti Latvala and Kris Meeke also finished inside the top six, with Meeke additionally winning the Power Stage to complete a very encouraging first competitive outing in the Toyota Yaris WRC. Tanak had begun the event in fine form, leading after Thursday night's opening stages, but ended Friday down in seventh overall after stopping to change a wheel. He then won all four stages on Saturday and the opening two tests on Sunday morning to make up a deficit of more than a minute to third position. "Last season, we won the manufacturers' title in our second year, but we also experienced many difficulties and retirements. To start this season, the entire team worked together and continued to 'Kaizen' ourselves to bring our speed and consistency to a new level for the opening round. Stronger and faster rivals made this year's Rallye Monte-Carlo very tough, in addition to the fast-changing road conditions experienced every year. Even under these difficult conditions, all three of our crews fought really well and were able to make the rally super exciting. Ott and Martin especially have shown superior fighting ability, just as they did last year. Even though they lost significant time due to the puncture, they won seven stages and claimed third place on the podium. Jari-Matti and Miikka drove calmly through the event and finished in fifth. Kris and Seb showed incredible speed in the Power Stage, while truly enjoying their first ride in the Yaris WRC. Their brilliant drives have showed us that we can expect wonderful results this season. From the balanced performance of the Yaris WRC and the supreme teamwork, I felt our team pushing towards winning this year's titles. We would like to ask for your continuous support for our TOYOTA GAZOO Racing Team this season." "It was a great finish to the rally for us and a very positive result. We have scored some good points for the championship. We were fastest on nine out of the 15 stages here, which proves the strong performance of our car. Kris's performance has been especially impressive in his first rally with us. I think he has sent a warning to everybody else for the rest of the season and everybody will be keeping their eyes on him." "I am very pleased with this podium. After Friday I didn't have such high hopes. I'm surprised we could catch all this time back on asphalt in relatively dry conditions. We had a good run this morning and then we just had to maintain our position to the finish. I'm really happy with the team, with my gravel crew and with the car. We did a perfect job on Saturday and Sunday and we should all feel proud of ourselves." "It was a close fight for the whole weekend, but I wasn't at my best, I must say. I'm disappointed that I couldn't take fourth place today. But I realise now that I made a mistake in our test and I developed the wrong sort of setup for the rally. Because of that, my car was understeering too much for my driving style, and the confidence wasn't there to go faster. But we had a clean weekend with no errors and we have scored some good points, which is important to start the season. We know that the car is capable of winning." "To win the Power Stage was an incredible way to finish our first rally with TOYOTA GAZOO Racing. We only set one fastest time this weekend but we did it when it counted. Other drivers were still fighting for their positions until the end, so to put it on the line and come away with the five points is great. We had technical issues this weekend that affected our result--fourth might have been possible--but to show our speed is really nice. The feeling with the car is really good. Finally, everything seems to be coming together for me, but we're only one rally in, so we have to stay concentrated now and look forward to Sweden." Rally Sweden (February 14-17) is the WRC's only full winter event, taking place on snow and ice. Metal studs inserted into the tyres punch through the ice to find grip, while drivers use the snow banks to stay on the road by 'leaning' through the corners. 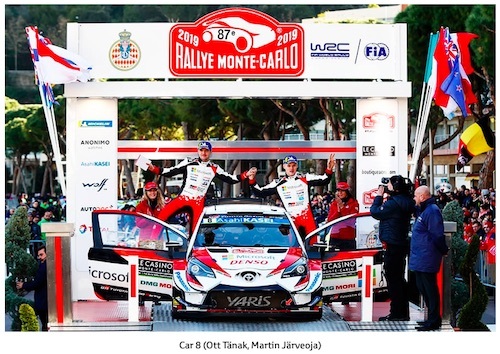 The rally was the scene of the maiden victory for the Toyota Yaris WRC in 2017, courtesy of Jari-Matti Latvala.